Use Lexicomp to look up drugs in current use. The Cumulative Index for Nursing and Allied Health Literature (CINAHL) is the authoritative resource for nursing and allied health professionals, students, educators and researchers for finding articles. The database also includes information about consumer health, patient education, and health sciences librarianship. It uses a special controlled vocabulary which overlaps in some areas with PubMed’s Medical Subject Headings (MeSH). Complete text for some articles and testing instruments are available online. How to export citations from CINAHL into RefWorks. Access Medicine includes Harrison’s Principles of Internal Medicine, Current Medical Diagnosis and Treatment, Guide to Diagnostic Tests, plus many more. NCLEX-RN Podcasts aimed at assisting students with their preparation for the NCLEX-RN® exam. Click the Stat!Ref link above and scroll down. 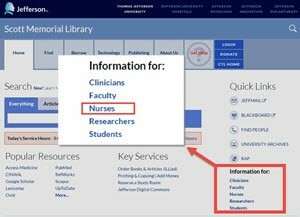 See also the Nurses Portal on the library homepage.